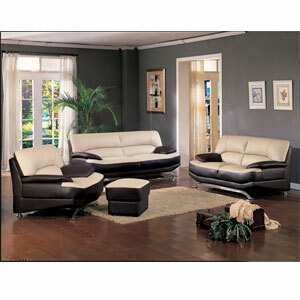 100 % Soft Bonded Leather Living Room Set. This Set Features A Sleek Contemporary Two-Toned Design Accented By Chrome Legs. Can Be Purchased As A 3-Pc Set Or Sold Separately. The Set Includes Sofa, Chair And Loveseat. Also Available (Sold Separately) Matching Leather Ottoman. Strong Construction. Easy To Assemble. Available In Black. See Related Items Below.